Tattoo removal is different for everyone. There are multiple factors that the clinician will look at, including where the tattoo is located (if on a leg, it could take longer because there is not a good blood supply); how much ink is there (meaning, did the artist saturate the tattoo to make it darker? ); and colors (some colors will go faster than others). I would also suggest making sure you go to an office that has a newer laser. For instance, we use the Cutera Enlighten laser. This machine can cut treatments in half because it uses nano and Pico seconds. Our range is typically anywhere from 3-9 sessions, depending on all of the different factors mentioned above. Each tattoo is different. 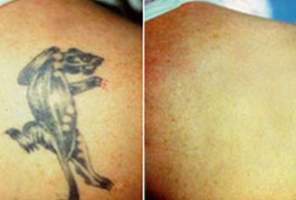 Some of the factors that will dictate time to remove a tattoo are: the type and amount of ink, depth of ink, ink colors, age of the tattoo, your skin type, and type of laser used. In our practice our average number of treatment sessions is 4-6. We use an Enlighten Laser.